Note: this handset has now been renamed the SLVR L7. Following on from our preview of the Motorola SLVR V8, we now have firmer details about the specifications of this device. Broadly speaking, this is a candy bar version of the RAZR V3 clamshell and at just 11.5mm thick it's certainly the slimmest handset from any major manufacturer. Weight overall is just 85 grams which is 10 grams lighter than the RAZR. The SLVR V8 features an impressive amount of technology for a handset this size, with Bluetooth a 176x220 pixel display, TransFlash memory (expandable to 256Mb) and a VGA resolution camera. The photographs issued at launch time are actually not very good, and there's a much better set of photos at Mobile Burn that show this is a much more attractive handset than it first seems. We actually called it "ugly" - but in a better light it looks quite attractive. Maybe a couple of beers would help though. There's a question over the screen resolution on the SLVR V8 though - the launch publicity clearly states that this is a 126x220 pixel device, but then the same publicity also mis-spells "Dynamic Idle" and "Dynamic Idol" and gives the dimensions of the C390 as.. err.. Q1 2005. It does seem though that this is actually a 176x220 pixel display in 262,000 colours and can only assume that Motorola's publicity people had been on the beers after seeing the publicity shots. 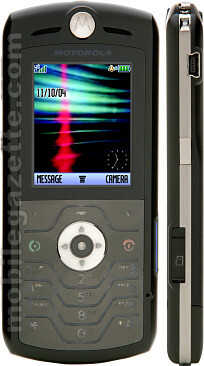 It's clear that the SLVR will have some of the same faults as the RAZR. The 5Mb of internal memory is puny, and that keypad can quickly become a pain. The VGA resolution camera is far too basic for a high-end handset like this. Other features on the SLVR V8 include PTT (push-to-talk), a WAP 2.0 browser, email client, instant messaging, Java, MP3 audio and MPEG 4 video playback and a reasonably decent internal speaker. Slated for a release in Q3 2005, the SLVR will probably hit the market roughly on time, being basically just a bar version of the RAZR V3 and it seems that prototypes are already around.. although we doubt very much that the SLVR will have quite the impact of the RAZR when it was announced.